"As noted by PPCoM, (The Professional Players Committee of Minesweeper), a league started up soon after the game's conception, the official theme song of Minesweeper has been nominated as "Here Comes the Boom", by Nelly." 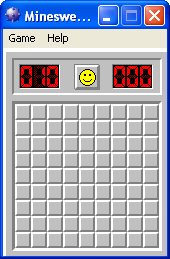 "The popular Minesweeper game under Microsoft Windows has a cheat mode triggered by entering the comment xyzzy, then pressing ⇧ Shift and then ↵ Enter, which turns a single pixel in the top-left corner of the entire screen into a small black or white dot depending on whether or not the mouse pointer is over a mine. This feature is present in all versions except for Windows Vista and the Windows 7 beta, but under Windows 95, 98 and NT 4.0 the pixel is only visible if the standard Explorer desktop is not running." Can you get this to work? If so what are you running for a OS?